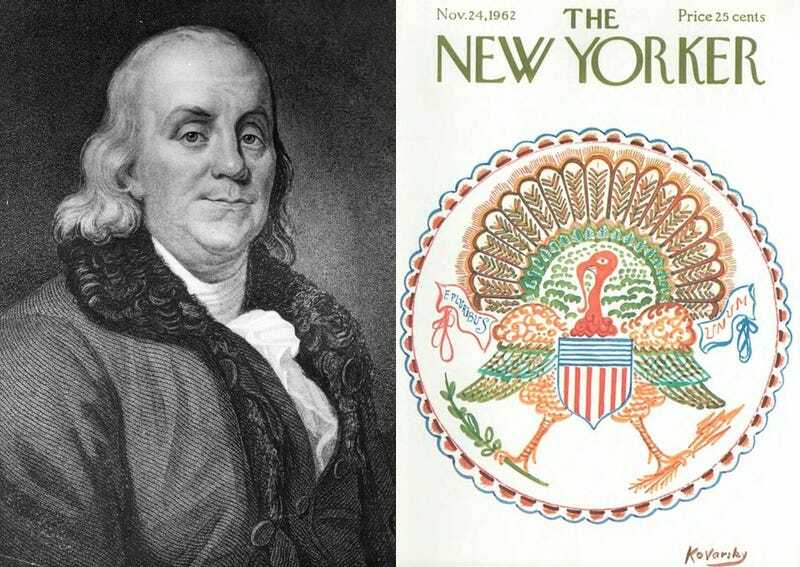 It’s one of those Thanksgiving fun facts I loved repeating when I was a kid: Ben Franklin liked turkeys so much that he wanted them to be our national bird, instead of the bald eagle. It’s a popular fun fact. But I was shattered to learn as an adult that this little nugget of trivia isn’t quite true. So where does this myth come from? Back in 1784, Franklin wrote a letter to his daughter in which he disapproves of the country adopting the bald eagle as our national symbol. He claims that the drawing that had been produced looked like a turkey anyway and that such a bird would actually be preferable to the eagle. Franklin explained that the bald eagle had a “bad moral character” and was a “rank coward” that merely steals from other birds. I am on this account not displeased that the figure is not known as an Eagle, but looks more like a Turkey. For the truth, the Turkey is in comparison a much more respectable bird, and withal a true original native of America… He is besides, though a little vain and silly, a bird of courage, and would not hesitate to attack a grenadier of the British Guards who should presume to invade his farm yard with a red coat on. So yes, he did float the idea that a turkey might be a better bird for a national symbol. But only within the context that people were claiming the bald eagle symbol already looked like a turkey. He never actually advocated this notion publicly or seriously. As Smithsonian magazine points out, this little fun fact has evolved and grown more popular over the course of the last half century, aided by a 1962 New Yorker cover (pictured above) featuring the turkey in place of the bald eagle. So feel free to play the obnoxious pedant over Thanksgiving dinner after everybody is nice and liquored up. But make sure you yell “DEBUNKED” as you flip over the dinner table. “FACTUALLY RULES,” is also acceptable.